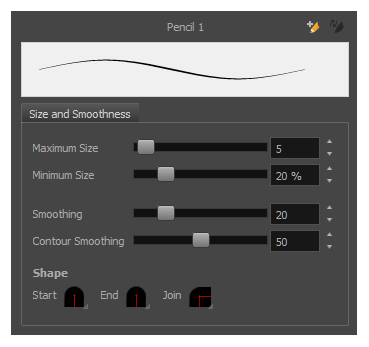 A variety of brush styles are provided allowing you to create and save your own.This way you can create brushes with precise sizes and parameters and save them so you can draw and design—see Drawing with Textured Brushes. There are several ways to display the available brushes: small or large thumbnails, or strokes. You can delete the brushes you no longer use. In the Tool Properties, select a brush style from the Presets section. The Brush properties are displayed. What you see depends on whether you are drawing on a vector or bitmap layer. In the Tool Properties view, select a brush to delete.